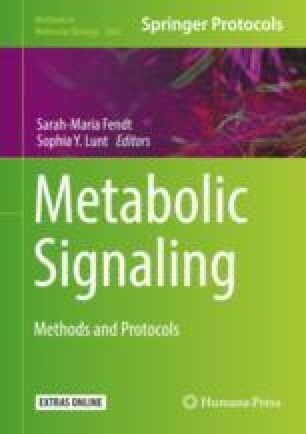 Metabolomics and 13C tracer analysis are state-of-the-art techniques that allow determining the concentration of metabolites and the activity of metabolic pathways, respectively. Three dimensional (3D) cultures of cancer cells constitute an enriched in vitro environment that can be used to assay anchorage-independent growth, spheroid formation, and extracellular matrix production by (cancer) cells. Here, we describe how to perform metabolomics and 13C tracer analysis in 3D cultures of cancer cells. MvG is supported by the Emmanuel van der Schueren grant from Kom op tegen Kanker (Stand up to Cancer), the Flemish cancer society. S-MF acknowledges funding from the European Research Council under the ERC Consolidator Grant Agreement n. 771486–MetaRegulation; Marie Curie—CIG, FWO—Odysseus II, FWO—Research Grants/Projects, Eugène Yourassowsky Schenking, and KU Leuven—Methusalem Co-Funding. We would like to acknowledge http://www.somersault1824.com for image elements used in Fig. 1 (Creative Commons license CC BY-NC-SA 4.0).